Jimmy and Katia Rocks are based in Florianopolis, Brazil. Jimmy and Katia met on a Mission trip in 2003 and married in 2006. They served as volunteers with the South American Mission Society. In 2007 they moved to UK, where Jimmy trained for ordained ministry at the Church of England in Bristol. 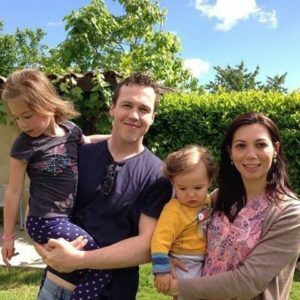 They have two young children, Joanna and Davi. They are part of the Church Mission Society because of their emphasis on sharing Jesus with others and pioneering. They run the Vineyard Institute, which is the Brazil Vineyard’s theology and leadership training course. Their church has also started the Alpha course. 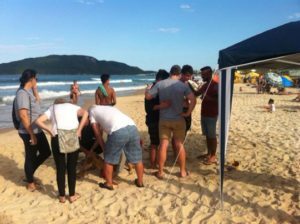 Outreach at the beach – praying with local people. Baptisms have taken place in a local swimming pool. They ran a conference with New Wine International. Some amazing testimonies of healing came out of the conference including a lady who only had 10 per cent vision in one eye and then, when prayed for, had her vision restored. Their church now has a website: www.vineyardfloripa.com. To share Jesus with others, plant new churches and help others to do the same. Give thanks for those who have stepped up in the life of the church and for all the great things that are happening. Pray for God’s blessing and protection for them as a family and for a good ministry/work family life balance. Pray for wisdom for them to use their time effectively. Pray for their ministry in Florianópolis, that they will see more people come to faith and become disciples of Jesus. Also that they will see a new church planted that will effectively reach their communities.